Sania maskatiya has nailed it again! We wonder how she manages to create magic out of everything she touches. Perhaps her super creative ideas bring life to every color she chooses or any fabric she tames. 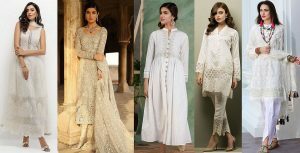 Her latest bridal collection is reflecting the same. Creating such an appealing piece of dresses by using just soft mellow hues is indeed something worth acknowledging here. Her taste reflects the certain elegance and a regal touch that mesmerizes every other fashion lover. Well! 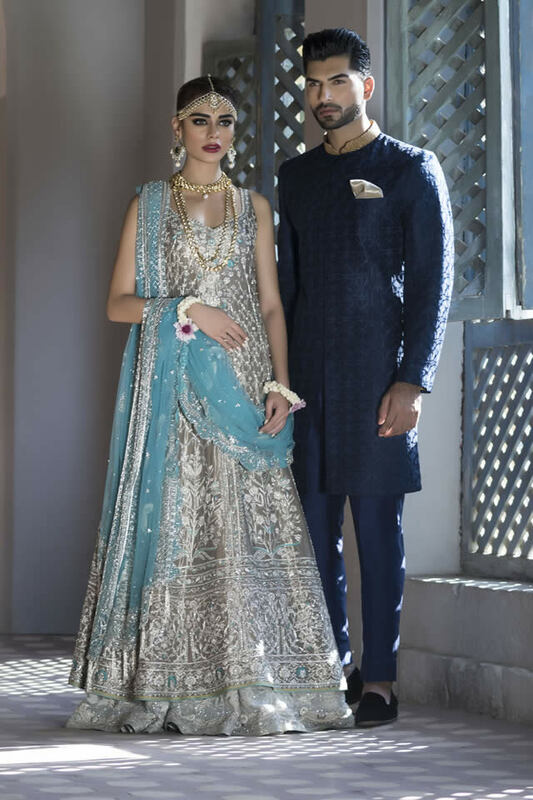 This new collection is a lot more to love, for not just the hues, but the cuts, designs, the combination of styles, embellishments and fine intricate use of embroidery works. 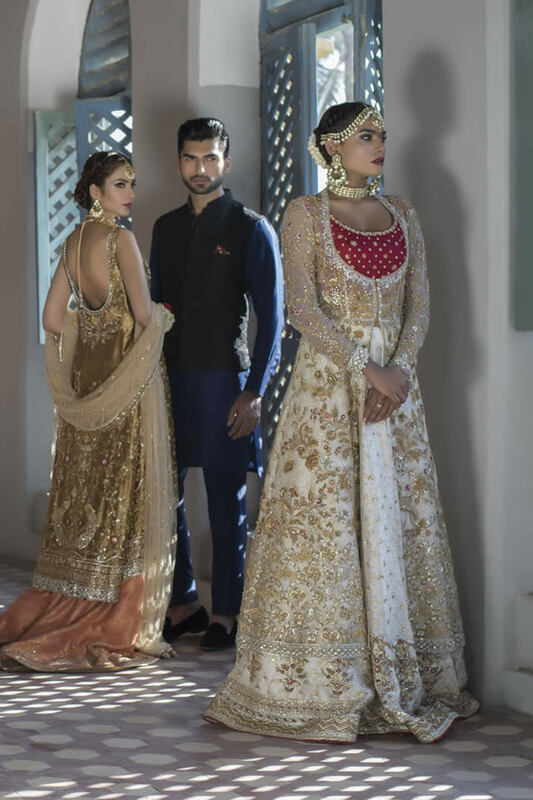 While the whole collection has already hit the market and out of business, here is some exclusive insight highlighting Sania Maskatiya best bridal dresses, the masterpieces of this collection. 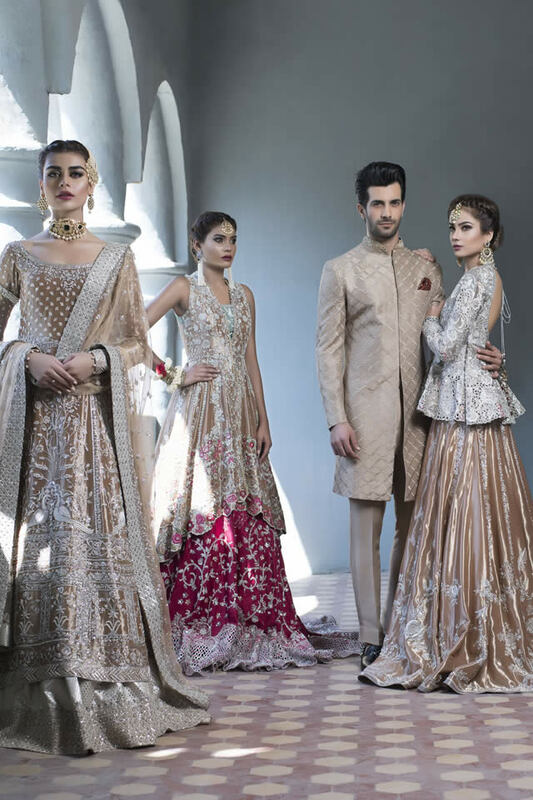 Sania Mustakiya recent bridal collection 2018 consists of best bridal dresses trends with amazing patterns. The assortment contains pure ethnic taste with some western cuts and curls. 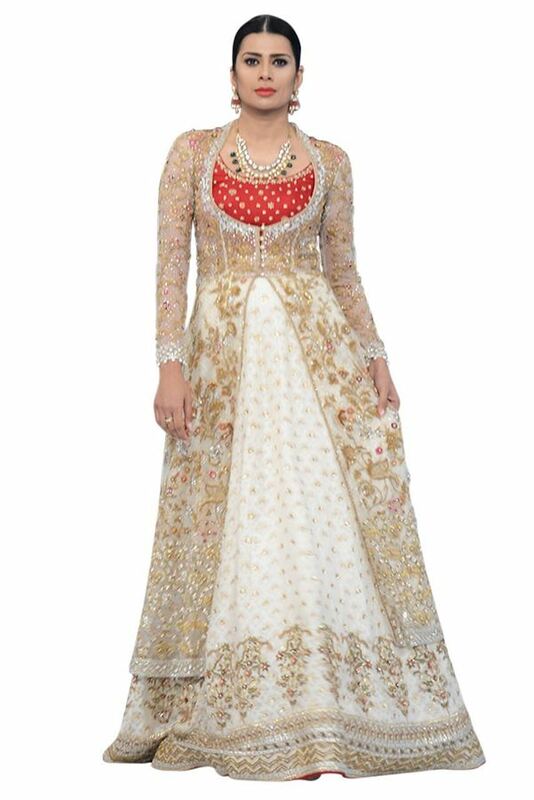 Long floor length gowns, crop tops, long shirts, lehengas, etc. Have a look on some of the trends. This dress is something not ordinary regarding its design. 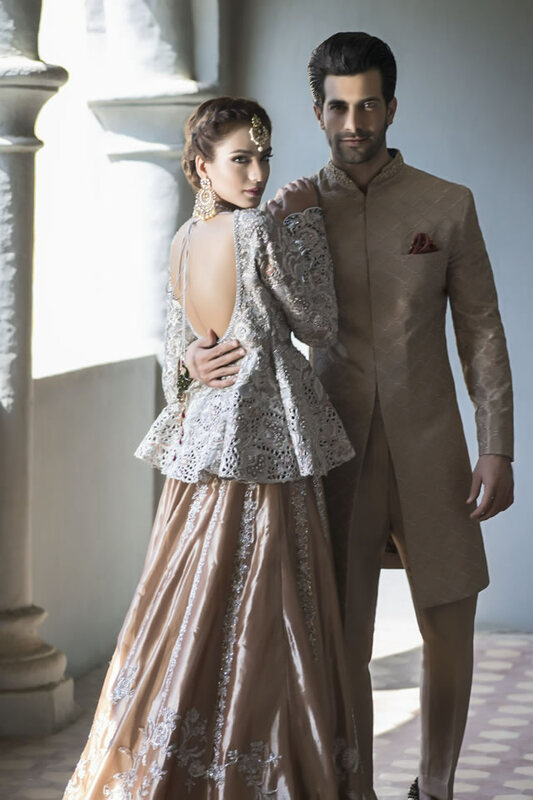 A cocktail top with lehenga is an entirely new venture to explore in the fashion world. Yet Sania has crafted with such skills that it has significantly amplified the beauty of that faun hues lehenga with fine work of embroidery. 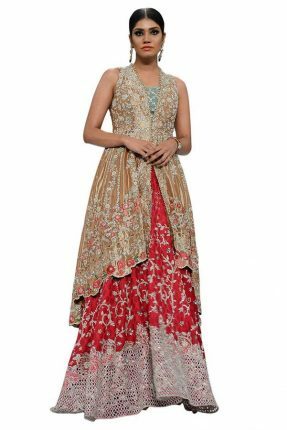 The floral patterns designed in long beautiful long whorls over the lehenga are complementing the contrast with the shirt. Whereas the delicate work in Zardozi and Dabka, using shimmery cut work over the shirt, says a lot about the expertise of the designer. When it comes to bridal dresses, red is a must to add in. But the way Sania added red to her collection is not something usual. 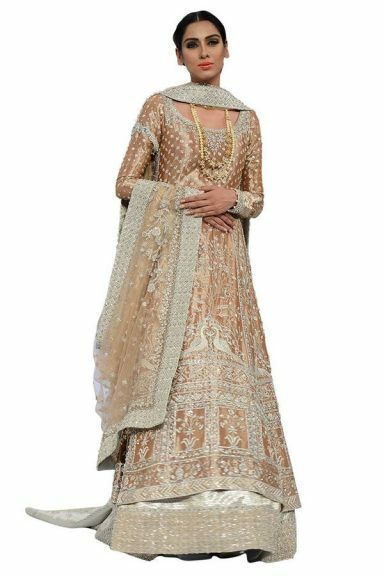 The dress with red lehenga is the finest piece of the collection, with heavy embroidery work in ivory, gold, and bit of silver. The entire bottom is covered in ivory, giving this lehenga a more royal touch. Whereas the shirt carries the mixture of various soft shades of faun, beige, gold and ivory. The border work on the shirt also carries tint of red color in its floral embellishments. This dress has the most charming and mesmerizing shade of blue which is so refreshing to look at and amazing to carry. 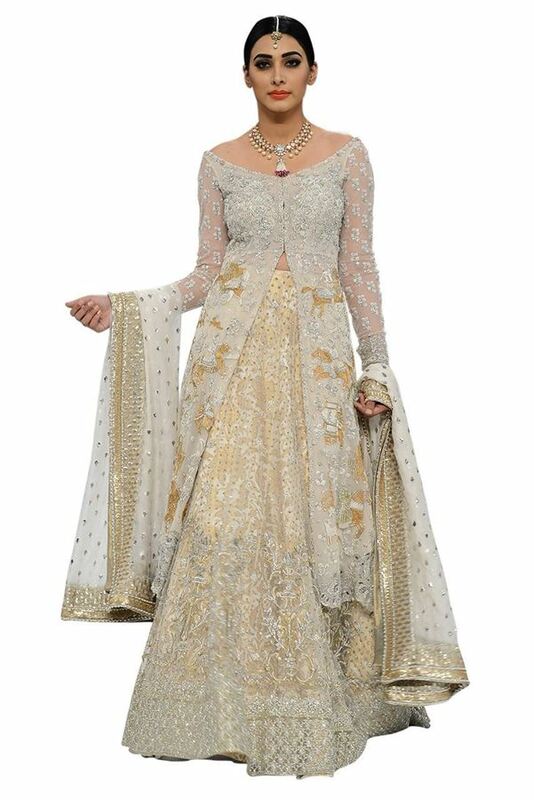 Moreover, the work in graphite and silver over the gown and dupatta is magnificent. 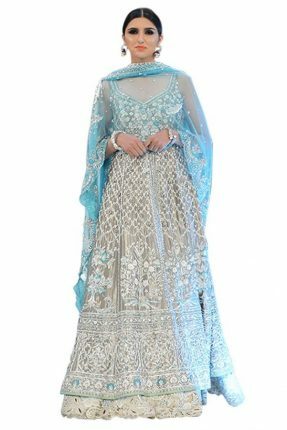 The entire dress is crafted using mellow shades of gray, silver and white whereas the dupatta in sky blue is greatly complementing those hues in the dress. 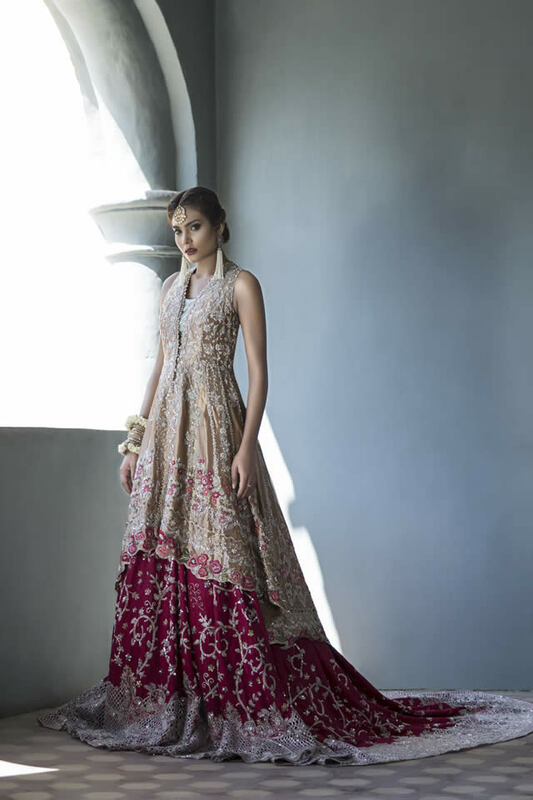 Other pieces of this collection include the variant styles of long shirts with lehenga, the very own traditional Pakistani Outlook. These dresses are also designed in mellow colors which mainly includes pastel peach, faun, and soft beige, etc. the work over these dresses carries shades of ivory and graphite. The White has its unique appeal. 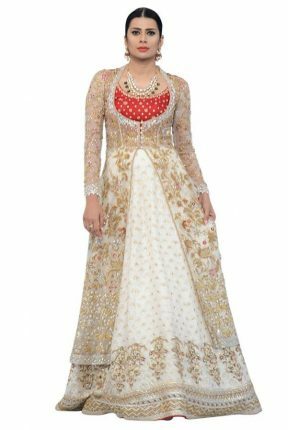 Hence keeping the significance of white in mind, Sania has also added white to the collection, in this fancy traditional style gown which has a bit of red in front whereas the rest of the dress is embellished with antique gold embroidery work. The lower half is double layered; the out light net layer is split from the front.